I'll be honest, I don't understand the fascination with Amish fiction. I've repeatedly walked away from the Christian fiction book section at local big box stores, overwhelmed by the number of bonnets on the covers. This year I found two Amish fiction books in my reading box for a contest. One, I enjoyed, the other, not so much. 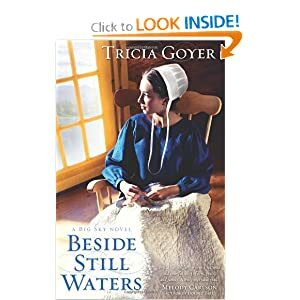 The one I enjoyed was Tricia Goyer's Beside Still Waters. What did I enjoy about it? Goyer's Amish heroine asked some of the same questions I've asked about the Amish lifestyle and doctrine. I appreciate Goyer's willingness to have a heroine who hungered for a relationship with God more than she desired approval from her community, while still honoring and respecting her parents and the good things about the lifestyle of faith in which she was raised. And there ARE good things, no question. Even for me, who considers the idea of living without modern conveniences like cars and electricity to be a horrible form of punishment, I can see the benefit of simplifying life, of focusing on faith and family by extricating oneself from all those external distractions. I appreciated Goyer's portrayal of a Christ-like hero whose personal walk with a living God overrode the customs and constrictions of a society bound by man's religious rules, even while showing respect for the faith of that society. I still don't understand why gossip and fault-finding and judgment and criticism are acceptable behaviors (as presented in the stories I read) and wearing the wrong bonnet or color are wrong. Even more confusing, why is it all right to use electricity if it runs off a car battery but not all right to have electricity wired in to your home from the local electric company? Why is it all right to use the "heathen" neighbor's telephone to call family far away, but not OK to have a phone in your own home? Why can the Amish hire unbelievers to drive them to town, and that's all right, but they cannot drive themselves? It's confusing. And no, I haven't studied it out. These are just questions that have come up from reading two books. Am I judging the Amish culture? Nope. Live and let live. If it's working for them, more power to them, in my opinion. What I am wondering is why so many Christian readers are fascinated by stories about the Amish way of life? What's the appeal? What makes you (if you're an Amish fiction fan) pick up a bonnet book before another book? Meanwhile, whether you are, or aren't, a bonnet book fan, Beside Still Waters is a good read, in my opinion! 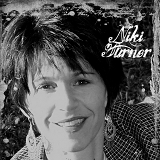 About the Author: Niki writes fiction, nonfiction, blog posts, newspaper articles, grocery lists, and Facebook status updates. She can be found at her own blog, In Truer Ink, in addition to posting here. She was a 2009 finalist in the Faith, Hope, and Love "Touched by Love" contest. I too had read this book and enjoyed it. I've read a few Amish fiction books and enjoyed them. But, I'm not a big reader of Amish fiction. I do not seek them out; nor do I understand the elevation of, or fascination with Amish lifestyle. I have never read an Amish book. I'm not opposed to them, I just haven't gotten around to them. I think the simplicity of the lifestyle may be the appeal in our crazy, unrestrained, over-busy society. Annette, I'm glad to know I'm not the only one! Well, count me as another who doesn't understand the appeal. I lived in central PA in high school/college -- maybe that's why? My problems with the Amish are two-fold: (1) the legalism and (2) their lack of outreach. That said, I'm reading a "bonnet book" right now because it was in a bag I got at a writers conference. I grew up near the Amish and I did find their way of life sort of charming. When I first saw Amish books, I thought they'd be kind of interesting. It was the onslaught of Amish fiction that I found disturbing. I did read and enjoy the Annie's People series by Beverly Lewis. The heroine in that book sounds similar to the heroine in yours. I do think, though, that it would be wise for any Amish person to seriously consider their detailed rules, the reasons for them, and their own motivations for following them. I personally, would never be willing to shun my children for not following my way of life no matter what. But it's also interesting that some people who leave the Amish still choose a simple, modest, rural lifestyle. I lived in PA for a few years, right across the river from Dina, so perhaps we visited the same Amish communities? I used to buy baked goods from them. We looked into buying furniture, but at that point in our lives, we couldn't afford it. My friends who love Amish lit enjoy the simplicity, and, perhaps, the expectation of knowing the rules. I wonder sometimes if they appeal because they're simultaneously historical (churning butter, social roles, candlelight) and contemporary (hospitals, temptation for technology, phones). Maybe that's just me, but it seems you can play with elements of both genres in Amish-set stories. I'm not a huge fan of Amish fic, but have read one of the new Amish mysteries and have a couple more in my TBR list. I will say that I spent the week in the Amish section of Ohio--a place I've been before and enjoyed. The crowds weren't there this year. And I'm wondering if the fascination with Amish culture has reached the saturation point and is in the decline. I like the simplicity of it, and perhaps that's why I live in the country. But from what I've seen, they've replaced the love of God and Christ's atoning sacrifice with a super-long and sometimes contradictory list of rules and regulations. Sad. I was thinking afterward (I was in a rush when I typed my comments), that legalism has a certain appeal. With a list of defined rules, you always know what is expected of you and you always know what is okay and what isn't. I come from a background with a list of rules (no dancing, no Sunday newspapers, no eating out on Sunday, no cards, etc.). And there is a certain comfort in those rules. And that's why it's such an easy trap for Christians to fall into -- just like the Jews of Jesus' day. Isn't it interesting that so much of Jesus' ministry was about NOT getting caught up in the do's and don'ts? Count me in. I don't get it either. I live in Amish/Mennonite country (and tourism and the wine industry). I love seeing the farms and the draft horses and the kids walking to school. I don't understand the forgiveness shown to some people (The shooter in the Amish school shootings) but not to others. I guess it's the lure of a somewhat secret society but as you've all said, it's incredibly legalistic. that said... I spent the day in 1812 and they have their own set of 'rules' (which don't sour me at all on 1812)! I'm Late, I'm Late! Or Am I? Does God Like Your Facebook Status? Do you love your temple? A Golden State Backlist: California! There are ventriloquist acts . . .
What Does Zondervan First Mean for You?